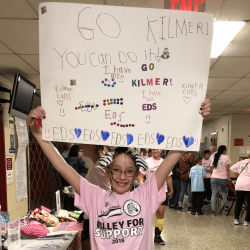 The Cherry Hill Education Association recently held their 14th annual, “Volley for Support” fundraising event, raising over $10,000 for the Ehlers-Danlos Society while spreading awareness for the Ehlers-Danlos syndromes (EDS) and hypermobility spectrum disorders (HSD). Over 500 people attended the volleyball tournament at Cherry Hill East High School in Cherry Hill, NJ. Teachers from each school compete in volleyball elimination tournament won this year by Horace Mann Elementary. 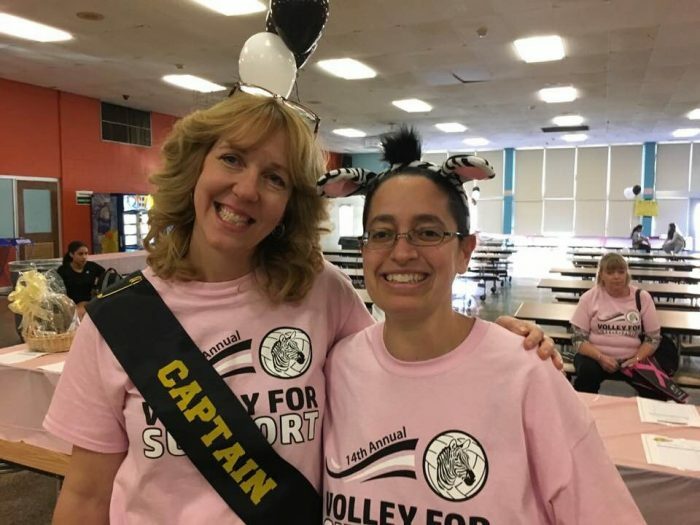 All 19 schools in the Cherry Hill school district participated in the fundraiser with ticket presales, custom zebra t-shirts, refreshment sales, face painting, a moon bounce, and a silent auction. Teacher Kathy Ripple Gilmour nominated the Ehlers-Danlos Society as this year’s beneficiary of the annual fundraising event. Students Samantha Lerman, age 7, and Julie Lerman, age 10, live with hypermobile Ehlers-Danlos syndrome (hEDS). Many attendees showed their support for Samantha and Julie, and all those living with EDS and HSD, by wearing zebra stripes, with two principals wearing full zebra costumes. In medical school, physicians are taught, “when you hear hoofbeats, think horses, not zebras,” meaning, common diagnoses are common for a reason and should be considered more highly than rare disorders in the diagnosis process. But sometimes, the hoofbeats do belong to a zebra; and sometimes, a rare disorder like an Ehlers-Danlos syndrome is the correct answer. The zebra has become the symbol of EDS and HSD, as well as the Ehlers-Danlos Society. The Ehlers-Danlos syndromes are a group of 14 inherited connective tissue disorders. Individuals who live with these conditions live with symptoms such as joint hypermobility, skin hyperextensibility, and tissue fragility, and are often diagnosed with several comorbid conditions affecting many different areas of the body. Vascular type (vEDS) is recognized as the most severe form of EDS and generally has a shortened lifespan due to catastrophic complications such as arterial rupture. The most common form, hypermobile EDS (hEDS), does not have an identified genetic cause. Hypermobility spectrum disorders are related to joint hypermobility and can cause symptoms just as severe and debilitating as EDS. The Ehlers-Danlos Society is a global community of patients, caregivers, healthcare professionals, and supporters, dedicated to saving and improving the lives of those affected by the Ehlers-Danlos syndromes, hypermobility spectrum disorders, and related conditions. Hosting a fundraiser? Let us know by filling out this form! For inquiries and assistance, please contact Carissa Hocevar, Development Director.